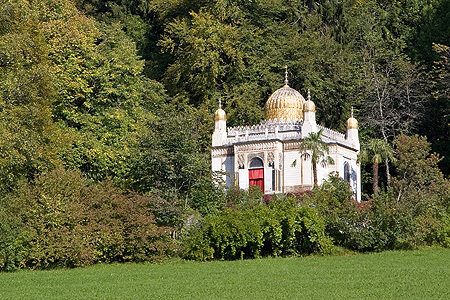 The Moorish Kiosk was originally created for the World Exhibition in Paris in 1867. Ludwig II purchased it in 1876 and had it magnificently and imaginatively decorated with a glass chandelier, a marble fountain and the sumptuous Peacock Throne. Here he read and drank tea while servants appropriately dressed in Oriental costumes and smoking narghiles lent an added touch of authenticity. The Venus Grotto is an artificial stalactite cave which was built into the hillside starting in 1875: the "Venus Grotto" stage set is from Act I of Richard Wagner's opera "Tannhäuser" and was constructed exactly in accordance with his stage directions. The huge painting shows the "Venusberg" scene from the opera. The electric lighting, which at the time was ultra-modern, was installed between 1878 and 1881. Exchangeable glass discs were used to produce a variety of coloured illumination. 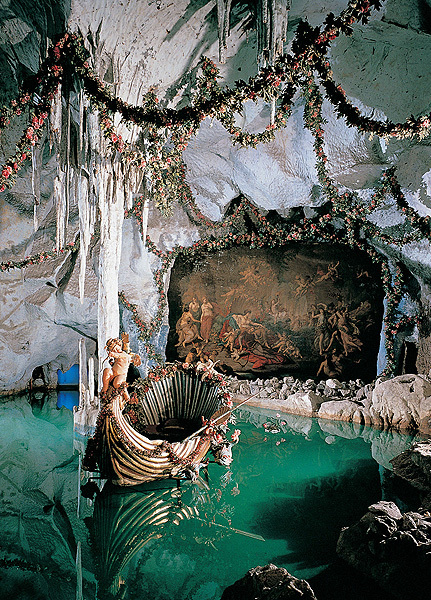 The Linderhof Grotto, with illusory effects that were highly innovative in their day, is one of the most fascinating examples of the 19th-century quest for the perfect synthesis of the arts. 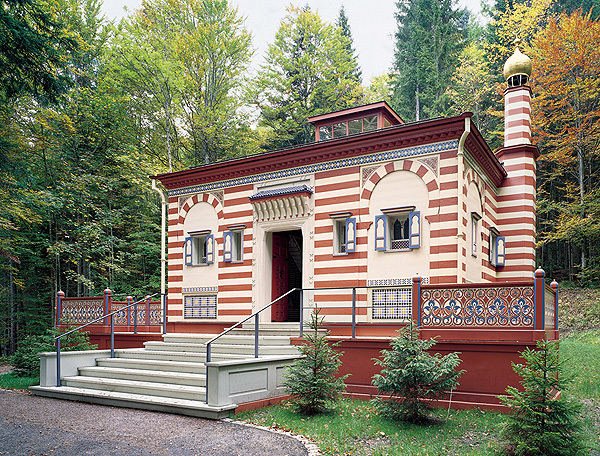 The Hermitage of Gurnemanz, a chapel-like hut, is part of the stage set for Act III of the opera "Parsifal", which Richard Wagner wrote for the consecration of his theatre. Here Ludwig relived this plot alone and read medieval poetry. Hunding's Hut represents a Germanic house. This stage set for Act I of Richard Wagner's opera "Die Walküre" was built exactly in accordance with his stage directions. Here Ludwig read Germanic and Nordic legends, with servants present in Germanic clothing for added authenticity. The Moroccan House, which was built for the World Exhibition in 1873 in Vienna, was purchased in 1878 for Ludwig II, who had it lavishly and decoratively furnished in the Moroccan style. The house, which was originally located elsewhere, has several rooms in which the king often lived for short periods. In the central room, which resembles an inner courtyard, the light enters from above through panes of coloured glass arranged in the shape of a pyramid. The Royal Lodge – a subsidiary building of the historical "Linderhof" and all that remains of the original farm – was first mentioned in a document in 1797. Converted into a hunting lodge by King Maximilian II, it was originally located in the open space in front of the palace. In 1874 Ludwig II had it dismantled and rebuilt in its present location. It acquired its "royal" status as the place where he lived until his palace was completed. After 1886, under Prince Regent Luitpold, it was once more used as a hunting lodge. Since 2011 it has housed a permanent exhibition "Vom Lynder-Hof zum Schloss" (From Lynder-Hof Estate to Linderhof Palace), on the long and varied history of the place and the building with its very different occupants – farmers and kings. The opening/closing dates depend on the seasonal weather. Due to restoration work the Venus Grotto is closed until further notice.